Whip the cream using an electric blender until it forms supple peaks. You can set aside a few dollops for garnishing. 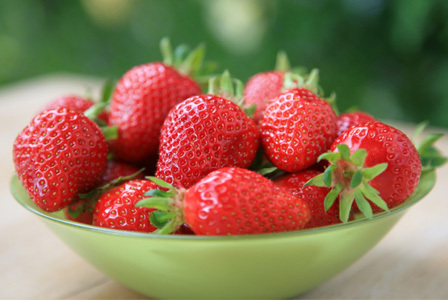 Wash and cut all the strawberries into small chunks and blend well in a blender till a thick puree is formed. Run the puree through a strainer and keep aside. 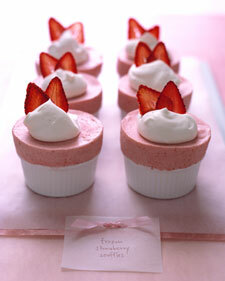 Keep aside a few of the strawberry chunks to add as garnishing. Mix the egg white and the sugar until it forms a thick meringue. Add the strawberry puree and mix all the ingredients together. Now pour the whipped cream on to the above mixture and fold the ingredients together lightly without using any force. Use a ladle spoon and scoop the mixture into 8 stemmed glasses or molds, (freezer safe) and top it with the extra strawberries and cream. Put the glasses inside the freezer to chill for 3-4 hours and delightful dessert is ready to be relished.